Today I saw a little guy maybe 3 years old riding a bicycle with his mom. As they crossed the street he stalled where the road met the sidewalk. She leaned over to give him a push and got him pedaling again, following right behind him. It seemed so symbolic to me, and that got me thinking about the people who give us a push when we need it the most and when we don’t. I’m talking about life influencers, those people in life who change us, who can set the course of our life path or make modifications to its direction. They shape us in some form or fashion and quiet possibly they change the trajectory of our lives. I can think of a handful of people who really made their mark on me and to this very day I am so grateful. I met Mrs. Moeller during my sophomore year in high school. She was the sponsor for the class I took that allowed me to be in the ‘work program’ where I went to class half day and worked half day. Having just moved into the school, she made me feel like I belonged. I met some of my greatest high school friends through her class and I landed my first real paying job with her guidance. My senior year I found my niche, going to work for a radio station through Mrs. Moeller’s program. She taught me self-sufficiency and began to shape my work ethic. Cindy hired me as her intern at K98 (intro to radio). She showed me the ropes and took a chance on the young, wide-eyed high school girl who wanted to learn everything she could. The general manager who gave me my first job in radio as promotions director, Beverly was an incredible coach and mentor. She believed in me. She taught me what it took to win and how to compete in business. She set the course. Then there was Doug, the most creative man I’ve ever met. He was my professional mentor and molded me into the marketing professional that I am. He paved the way without ego. It was never about him, but me. Life changers are not limited to colleagues and bosses. One of my best friends today, Sylvia was a colleague when we became very close. She was there for me during some very tragic, life changing times of my life. She was an advisor to the highest level. Someone I could count on to give me objective life advice. She was an encourager. She provided a safe place. She covered me and loved me like one of her own kids. She strengthened me. Another friend, who set me on a professional journey that would drastically change the course of my life, supported me and encouraged me to pursue a calling over a career. He ignited my passion for fighting bullying which eventually lead me to leave an industry of 20 years and to pursue a role in fundraising for anti-bulling programs. Through this work, I grew to have an incredible passion for social justice that I pursue today. Most importantly, He whole-heartedly supported my relationship with Jesus and encouraged my faith walk to a degree that spurred a change in the person I am today. 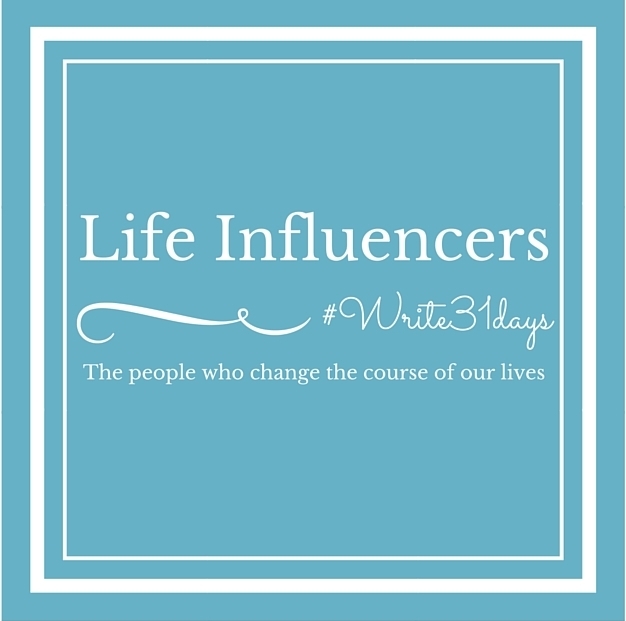 I believe that God puts people in our lives just like these life influencers. It’s amazing how I look at my life and see God’s handy work through people like these.